There’s surprisingly little literature published on the cost of HCAI outbreaks. In this context, a useful Dutch study in PLoS ONE counts the cost of 7 HCAI outbreaks. 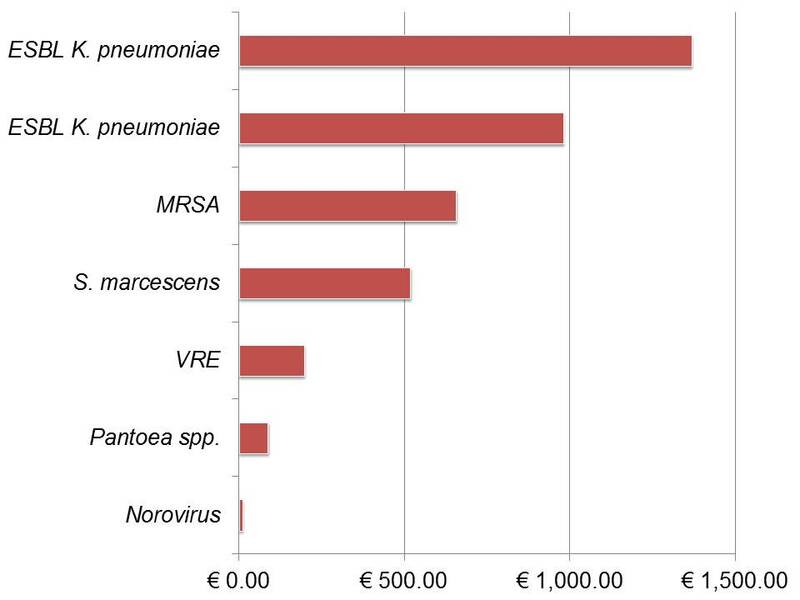 The range in cost for the 7 outbreaks studies was large, from around €10k to €350k, illustrating the differences in organism, setting, and scale of the outbreaks. Interestinglhy though, the number of patients in the outbreak did not affect the overall cost in the way that you may expect. The cheapest outbreak was a fairly large outbreak of norovirus affecting 37 individuals, and the most expensive outbreak was a small Serratia sp. outbreak affecting on 8 patients in the ICU; the reason for this is the bed closures generated, and the long duration of the Serratia sp. outbreak (86 days). One of the most useful outcomes of the study was an ‘average cost per positive patient per outbreak day’. Although the Serratia sp. outbreak was the most expensive overall, the two separate ESBL-producing K. pneumoniae outbreaks were the most expensive on a per day basis. So, if they had gone on for much longer, they would have quickly overtaken the Serratia sp. outbreak as the most expensive overall. Interesting to note that neither of the K. pneumoniae outbreaks were in the ICU, so the bed closures would have been even more costly in this setting. Having a cost per patient per outbreak day is handy, and allows easy comparision with your outbreak. Pick the most comparable pathogen / setting combination, and count how many outbreak days you have to get to a reasonable estimate of the outbreak cost. Figure: Average cost per positive patient per outbreak day of 7 HCAI outbreaks. It’s a shame that the authors did not make a clear distinction between actual expenditure incurred by the hospital, and opportunity cost / missed revenue. This is especially important since the lion’s share of the costs (around 50%) were accrued through missed revenue resulting from bed closures. Depending on how your healthcare system is configured, this may be a fairly “soft cost” for the hospital. It is also of note that fixed personal costs were excluded. Whilst these would not make it to the hospital’s profit and loss account, they are important: the time spent managing these outbreaks would otherwise have been spent investing in proactive infection prevention activities – though I accept that this is difficult to quantify. Having accurate data on the cost of HCAI outbreaks is crucial in justifying investment in prevention activities. Although outbreaks are, by their nature, sporadic and difficult to predict, we know that solid infection prevention will prevent them. So the question for your administration is whether they’d prefer to pay a small, budgeted upfront investment now, or gamble on the small possibility that they won’t have to pay a large, unbudgeted outbreak management cost later. Sadly, I expect that many would choose the latter!